If this review ultimately turns into an advertisement for the Cinema 100 Film Society, please forgive me. It just saddened me to watch easily the best movie of the year in an empty theater. Hopefully, when you read this, the superb “Happy-Go-Lucky” is still playing at the Carmike. The movie is the latest character-driven masterpiece by British director Mike Leigh. His work is in the “kitchen sink” genre – movies that look at day-to-day activities of the British working class. And Leigh’s methods are quite unique. He doesn’t write a script. He casts interesting actors, interesting faces. He then has them improvise and let casual things happen and natural words spill out of their mouths. When all are happy with the results, a script is transcribed. Leigh has a great sense of dramatic and thematic necessity and constantly keeps these improvisations on track. 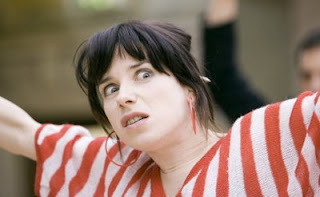 “Happy-Go-Lucky” is tightly constructed with everything revolving around the perpetually positive Poppy (luminously played by Sally Hawkins). She makes it her mission to cheer people up and never let anyone bring her down. It is also a movie about teachers, good ones and bad ones and bad ones desperately trying to be good ones, teaching being an occupation Leigh feels requiring of a positive outlook more than any other. The results are frequent scenes that have that truth-is-stranger-than-fiction quality usually associated with documentaries. You’ve heard the saying, “No writer could’ve come up with that.” Leigh’s movies are filled with those moments like the way a scene suddenly pauses for the characters to hold a staring contest, to see who’ll blink first. There’s a scene where Poppy and her roommate Zoe curl up together on a bed and twirl each other’s hair that’s so touching it aches. The movie opens with Poppy riding her bike up to a bookshop and entering to browse the shelves. She cheerfully attempts to start a conversation with the taciturn clerk, finally asking him if he’s having a bad day. He replies, almost startled, “No.” She wishes him well and departs to find her bike has been stolen. But not even that can remove her smile. The rest of the movie plays like an expanded version of that bookstore encounter as she engages in a relationship with an unpleasant driving instructor (Eddie Marsan). Their every lesson has him doing his best to tear her down while she holds tightly to her cheerful world view, and high-heeled boots. Their final lesson is simply the most painful and remarkably revealing movie scene in recent memory. It is award worthy. It is another scene that couldn’t have been written; it had to emerge from the actors in some way that’s more direct, more primal. When I noticed the movie listed in the Carmike ad, I thought “bad news for Cinema 100 and good news for Bismarck/Mandan.” While planning the upcoming series running from January 29 through April 23, “Happy-Go-Lucky” was at the top of our list. Now we’ll have to re-think a slot. It may not be “good news” for anyone though if only a handful of people see it. Over 300 lucky moviegoers would have seen it in the series – and they would’ve all left very happy.